American clergyman, born at New Haven, Connecticut, on the 12th of October 1775. He was a descendant of one of the founders of the New Haven colony, worked as a boy in an uncle's blacksmith shop and on his farm, and in 1797 graduated from Yale, having studied theology under Timothy Dwight. 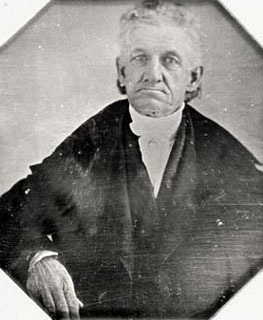 He preached in the Presbyterian church at East Hampton, Long Island (1798-1810, being ordained in 1799); in the Congregational church at Litchfield, Connecticut (1810-26), in the Hanover Street church of Boston (1826-32), and in the Second Presbyterian church of Cincinnati, Ohio (1833-43); was president of the newly established Lane Theological Seminary at Walnut Hills, Cincinnati, and was professor of didactic and polemic theology there (1832-50), being professor emeritus until his death. At Litchfield and in Boston he was a prominent opponent of the growing heresy of Unitarianism, though as early as 1836 he was accused of being a moderate Calvinist and was tried for heresy, but was acquitted. Upon his resignation from Lane Theological Seminary he lived in Boston for a short time, devoting himself to literature; but he broke down, and the last ten years of his life were spent at the home of his son, Henry Ward Beecher, in Brooklyn, New York, where he died on the 10th of January 1863. Magnetic in personality, incisive and powerful in manner of expression, he was in his prime one of the most eloquent of American pulpit orators. In 1806 he preached a widely circulated sermon on duelling, and about 1814 a series of six sermons on intemperance, which were reprinted frequently and greatly aided temperance reform. Thrice married, he had a large family, his seven sons becoming Congregational clergymen, and his daughters, Harriet Beecher Stowe and Catherine Esther Beecher, attaining literary distinction.